The Adam Goodes booing saga has me shocked. I’m not shocked at the incident itself; as a lifelong AFL supporter I’ve seen a lot of booing in my time. I’m not shocked at the accusation of some of the booing being racist; clearly we can all acknowledge that even though many of the booers have no racist intent, some of them do and obviously all the booing of Goodes must stop. I’m not even shocked at the saturation media coverage of the story, and the fact that everyone who is anyone has weighed into the debate; social media has also been in a lather all week. This all comes as no surprise to me. The issue is rightly one that should be discussed and I welcome calls for a national focus on combatting racism and discrimination. What does however come as a huge shock to me is that the public seem shocked that racism exists in our country. Anyone who is surprised that in a crowd of around 30,000 members of the Australian public, there are a few hundred racist people, needs to take a closer look at their country. Because of course there are racists in Australia. Have you seen who our Prime Minister is? I understand that it’s not a nice subject for many people to talk about because it doesn’t make them feel very good about Australia. But let’s take a good, long, hard look at ourselves and avoid the temptation to put our heads in the sands of denial. The election of Tony Abbott and the continued national acceptance of his strategies of using divisive, racist policies to turn Australians against minority groups is all the proof you need of a strong racist element that runs through our national veins. Let’s not forget that racist attitudes gave birth to Pauline Hanson and her One Nation Party. Sure, this party hasn’t had any recent success. But it’s easy to forget that in the 1998 election, Hanson’s party received 9% of the vote. And then of course Abbott set up a slush fund to get rid of Hanson. Because his Liberal Party needed her voters. And his Liberal Party has been courting the votes of those people who supported Hanson’s racist views about indigenous Australians and opposition to multiculturalism ever since. How has this huge population of racist Australians whose votes are so important to the Liberal Party’s electoral success escaped the attention of people so completely shocked by the Adam Goode’s booing saga? This is not some niche success either; this is Abbott’s success at becoming Prime Minister. Fear-mongering towards racists is at the heart of Abbott’s favourite vote-winning, or poll-lifting policies. Look at Abbott’s obsession with national security, including his reaction to the Sydney siege, which was automatically framed as part of the ‘Islamic fundamentalist terrorist’ threat facing Australia, rather than a mentally-ill-lone-nutter who just so happened to be of Muslim faith. Who do you think Abbott’s appealing to when he talks about ‘Team Australia’ and says ‘whose side are you on’? When he obsesses over taking away people’s passports? Yes, it’s the part of Australia who boos Goodes for racist reasons. And what about Abbott’s asylum seeker policies that block the world’s desperate displaced people from getting to Australia, or living here if they’ve arrived previously. Does Abbott stand up for the indigenous Australians living in poverty stricken remote communities by working to improve their access to healthcare, education and social services that would help to narrow the gap? Of course he doesn’t. Instead he makes racist statements about their ‘lifestyle choice’ after withdrawing Federal support, forcing the WA government to close over 100 communities down. Where was the outrage then? More recently, Abbott has refused to ban one of his government MP’s from speaking at, and endorsing, a Reclaim Australia rally. 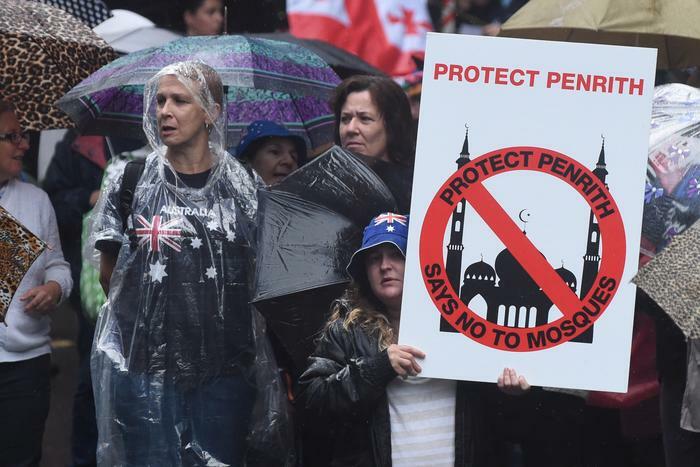 These rallies were attended by Australians who hate a particular religious minority so much that they are willing to march in the streets to advertise their hatred. Does the site of these rallies not shock Australia? Do people waving Swastikas in our streets not warrant a national conversation about racist elements in our society? Apparently not. The point is, Tony Abbott isn’t some bogan at the footy booing an indigenous footballer. Tony Abbott is our Prime Minister. He was chosen by the country to represent us. He’s supposably the best leader we could find. And his entire political career is reliant on division, scare-campaigns and appeals to the racist element of Australia which people shocked by booing football fans appear to forget exists. So I’m glad that something has put racism on the agenda, even if it’s not the issue I expected to spark the debate. And now that we’re talking about racism, and we’re all determined to do something about it, can we have a look at the Prime Minister we’ve chosen and accept that if we’re going to be shocked that racism still exists in our community, we should be shocked, and ashamed, that Abbott and his government represents us. On the subject of booing, having its origins in ancient Greece for bad performance by actors on a stage by the audience or the other the thumbs down is another one, while hissing sounds of contempt representing those snakes amongst the crowed. These days coming from both sides of the fence, spectators will continue to boo down the umpires, becomes a fact of life. So what will Captain Abbott do well introduce on the spot fines. The Booing Tax. There is one thing I have noticed Victoria, is that since Abbott became opposition leader racists slogans has blossomed again into reality, having been there for a long time, but kept under wrap by tolerant few. Thanks Vic for another well written article.